As most of you know, we love quotations. That’s why Inspirational Quotes for Teachers is so special to us. 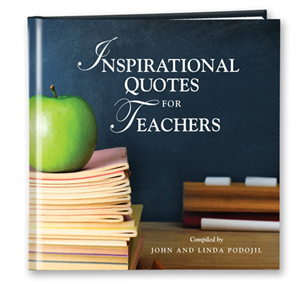 It’s also made special by the two people who compiled these quotes for teachers—John and Linda Podojil. In elementary school, John was hard of hearing and failed the first grade because only he knew he could not hear. He read people’s lips to try and learn, but could not when they turned away from him. John was diagnosed with an 80 percent hearing loss and underwent an operation to restore his hearing. He was a high school dropout, but some special teachers were able to ignite his love of learning…so much so that he eventually received a GED and an associate’s degree. John went on to teach technical education at the University of California, San Diego; California State University, Dominguez Hills; and the College of Southern Nevada. He has presented at both Cornell University and Stanford, educated over three thousand technical education instructors on safety in technical skills classrooms, and is an advocate for technical education. John says his greatest teacher of all times is his wife, Linda. Linda also was a teacher. Before retiring from the Boeing Company as full-time safety administrator at Boeing Portland and also in Seattle, Linda was a part-time safety instructor for South Seattle Community College, where she taught occupational safety and health-related subjects. John and Linda know that teachers who believe they can make a difference do make a difference. We hope that you enjoy Inspirational Quotes for Teachers and that, in a small way, it helps to recognize those special teachers who are changing the world, one generation at a time.